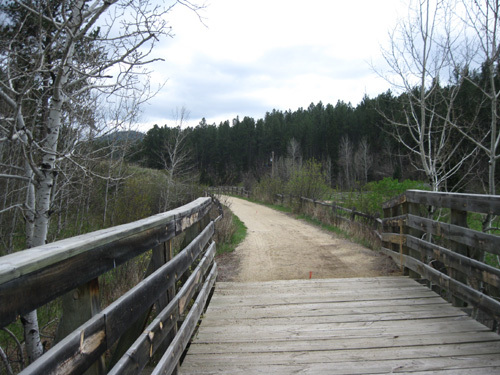 " South Dakota’s George S. Mickelson Trail is more than just a recreation trail; it’s a trail of history. 100 years ago to accommodate the miners who had rushed to the area to pan for gold. years of planning, hard work, and determination the trail became a reality . 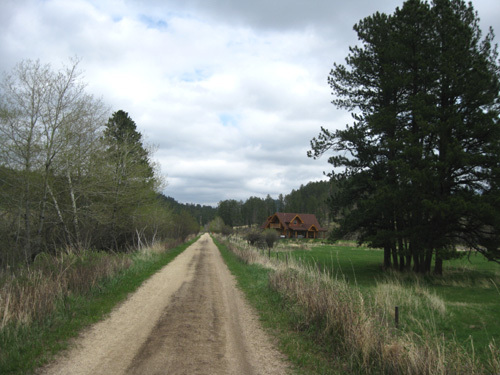 . . "
Visitors and nearby residents have a wonderful opportunity to enjoy not one but TWO long trails that run basically north-south through the beautiful Black Hills of South Dakota: the Centennial Trail, a hiking and riding trail which runs for 111 miles from Bear Butte State Park to Wind Cave National Park on the eastern side of Black Hills area, and the Mickelson Trail, a rails-to-trails project extending 109 miles from Deadwood to Edgemont through the central Black Hills. Both sound like a good place for an ultra-distance foot race, don't they? That's not so far-fetched. There used to be a 50-mile trail race through the Black Hills back in the 1990s but I don't remember its name or exactly where it went. I printed out some information because I considered running it, but that file is back in Virginia. I hiked part of the race course that was on single-track trail, so it wouldn't have been the wider Mickelson Trail. By the time I moved to Billings, MT in 1999 I believe the race had been discontinued. 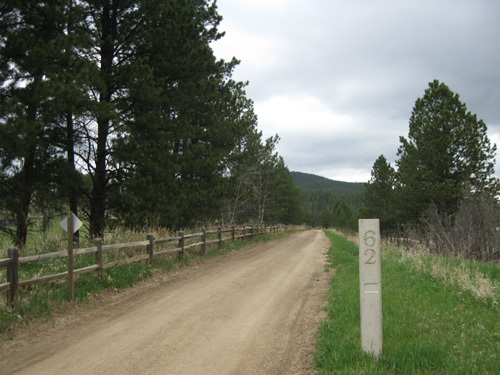 We first became aware of the Mickelson Trail, which was completed in 1998, when the Lean Horse Hundred, Half Hundred, and 50K foot races were established a couple years ago. All three races begin in the town of Hot Springs and head west toward the town of Pringle, where the 50- and 100-milers run a total of 18 or 68 miles, respectively, on the Mickelson Trail. The hundred turns around at Dead Broke Street (!) and returns to Hot Springs. Lean Horse is considered to be one of the easier 100-mile trail races because it is on a fairly smooth, wide trail without any big hills. Of course, there are no easy 100-milers. This is just one of the easier ones compared to those in the mountains or at higher altitudes or with gnarlier footing. Still, its late August date (think heat) and gentle hills are a challenge to some runners who prefer cooler weather, lower altitudes than approximately 4,000-5,000 feet in elevation, and more hills to use different leg muscles. 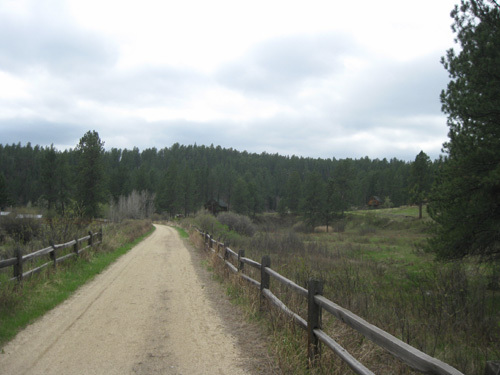 If you're not up to an ultra, the Deadwood-Mickelson Trail Marathon and Half Marathon are also run on this trail. 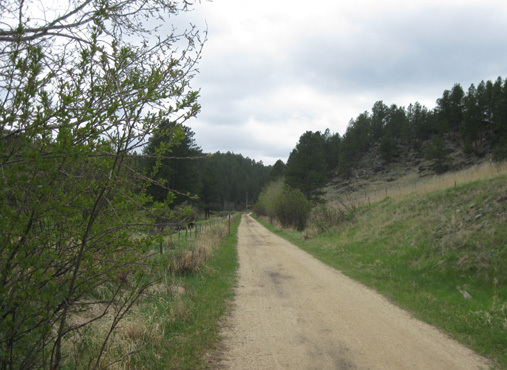 I mentioned in yesterday's entry that we could see part of the Mickelson Trail as it paralleled the highway various places between Pringle and Hill City as we were driving to Rapid City earlier in the week. I included two photos of the trail that I shot from the truck as Jim was driving. I don't know if the Lean Horse 100 goes that far north but I wanted to run part of the trail -- preferably not in sight of a highway, however. 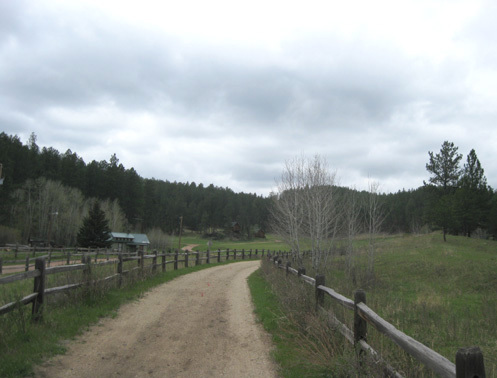 When I got online to see just where the trail runs, I found a section going north from Hill City that appeared to be in the middle of nowhere and easily accessed after we left Custer State Park this afternoon. That fairly short run is the topic for this entry. I saw only a small part of the Mickelson Trail but it has me curious to see more of it. There are some very scenic pictures of rock formations and tunnels in the trail brochure, for example. The section I ran was through a pleasant valley past several houses and through some woods. I'll show some of the photos I took in this entry. 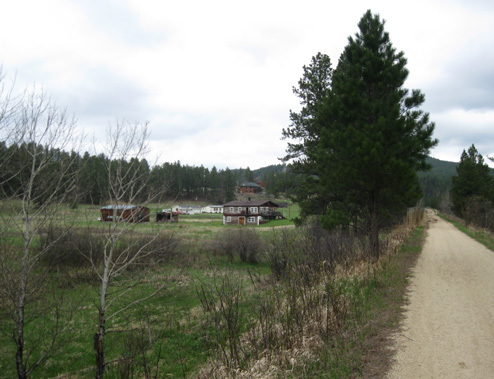 When we left through the NW entrance/ext to Custer State Park earlier this afternoon, we headed north on Routes 87and 16 for several miles to the small town of Hill City. 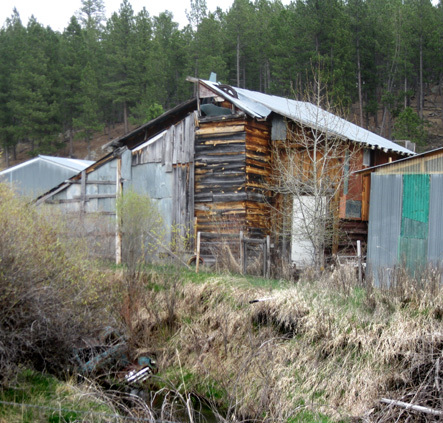 The first settlers in this area came looking for gold, copper, and tin in the 1860s. Ranchers and lumbermen soon followed. Population is currently fewer than a thousand people. 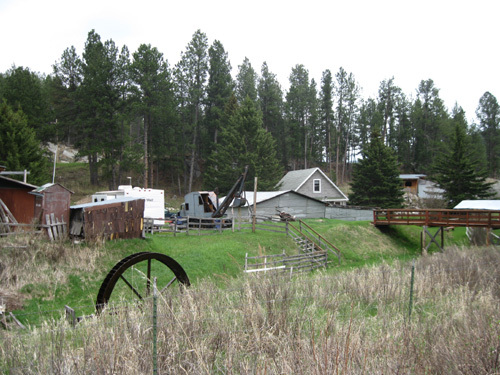 Old mining towns in the Black Hills are similar to old mining towns anywhere out West: in their heyday they usually had more saloons and brothels than stores or churches! 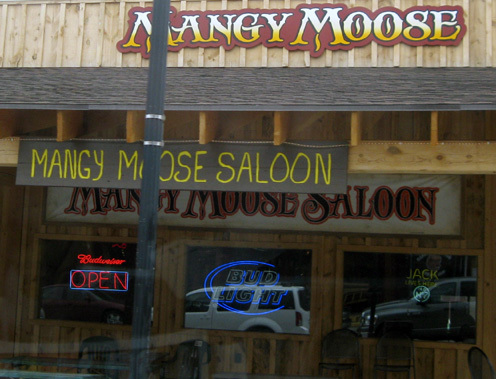 Times have changed, but if you visit Lead or Deadwood or Keystone or Hill City you will still find plenty of watering holes amongst the gift shops and jeep touring companies. No, we didn't see any moose in the vicinity. But we did find a couple of the Mickelson's trailheads in town. There are lots of trailheads from one end of this trail to the other. From the website and trail brochure I picked up, I learned quite a bit about the history of the trail, its character, and why it's so popular. I'm sure there were some "characters" who lived along the trail before, during, and after the historic Deadwood to Edgemont Burlington Northern rail line ran through here, but what I'm talking about is the personality of the Mickelson Trail, named after Governor George S. Mickelson, one of the trail's earliest and most ardent supporters. 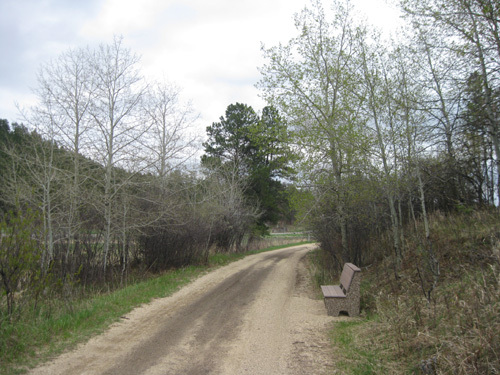 The Mickelson Trail passes through many different types of terrain, including prairies, wetlands, heavily forested areas, and picturesque valleys with pastures and creeks. It affords views of nearby granite mountains and rock formations. 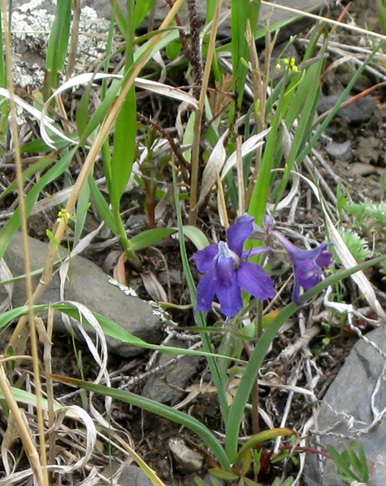 Most of it is on private property, although some goes through national forest land. I had no idea where the part of the trail I was using would take me. I could see only that it didn't follow a highway. I assume it was through private property, as I passed by several houses. All of the Mickelson Trail is gently sloped, just like the railroad bed it was prior to being converted to a multi-use trail. Most of the trail has a 3% grade or less, making it accessible to most mobility-impaired users. Elevations range from about 3,500 feet to abut 6,300 feet. Most of the trail is smooth crushed limestone and gravel; skinny-tired bikes aren't recommended. The trail is wide enough for two-way bicycle, equestrian, and foot traffic. It is open for snowshoeing and cross-country skiing in the winter. 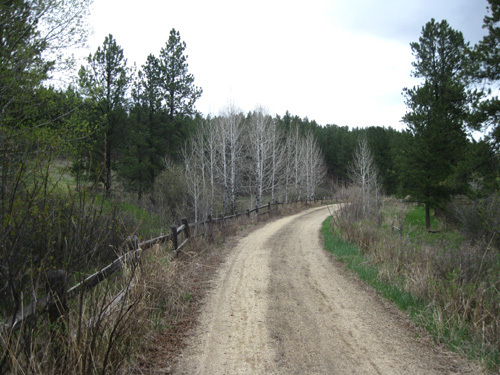 The only motorized vehicle use allowed is snowmobiling from Deadwood to Dumont at the far northern end of the trail. The Mickelson Trail has concrete mile markers, which I really appreciate since I don't wear a GPS when I run or walk. It crosses more than a hundred converted railroad bridges and passes through four hardrock tunnels. Unfortunately, I didn't have time to go far enough today to see any of the tunnels but I crossed several nice wooden bridges, ran along a creek, and enjoyed a wetland area. Amenities along the 109-mile trail include benches with scenic views, interpretive signs and displays, and some water cisterns, vault toilets, and shelters with picnic tables at sporadic intervals. Check the trail website for information about staff-guided events and special events like running and bike races. 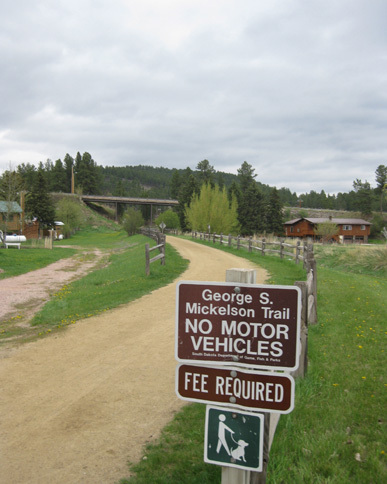 All trail users age 12 and older are required to have a trail pass on their person, except for the parts of the trail that are within city limits of the several towns through which it passes. Fees support trail upkeep. The daily fee is $3 per person; annual passes are $15 per person. Since I was going north past the Hill City limits, I filled out a form, put my $3 fee in the self-registration box, and headed off with Cody. Jim is still resting from the Jemez race so he stayed near the trailhead and read a book while I ran and walked several miles out and back. 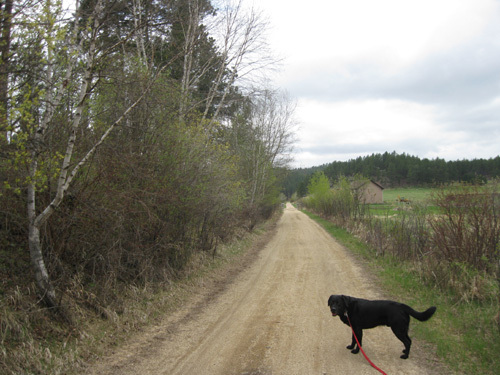 All the trail photos shown in this entry are from today's hour-long excursion. The website and guide warn trail users about the possibility of encountering rattlesnakes and mountain lions along the trail, as well as cattle grazing in open areas. I'm glad I've never run into a mountain lion on any trail, anywhere. I've seen plenty of rattlesnakes but fortunately have never been bitten (Jim has). Cattle sauntering down a trail or grazing next to it simply aren't a problem if you let them know you're coming and walk past them, not run. I didn't see any mountain lions, rattlesnakes, or free-range cattle today. All I noticed were horses in a fenced pasture, ducks in a creek, some songbirds, and a few small mammals like rabbits and squirrels. Dogs are supposed to be on a leash no longer than ten feet long. I complied (well, for most of our little jaunt) although I didn't see anyone else on the trail in the hour I was out there. As you can see in several of the photos above, some trees haven't leafed out even in late May at this altitude and latitude. 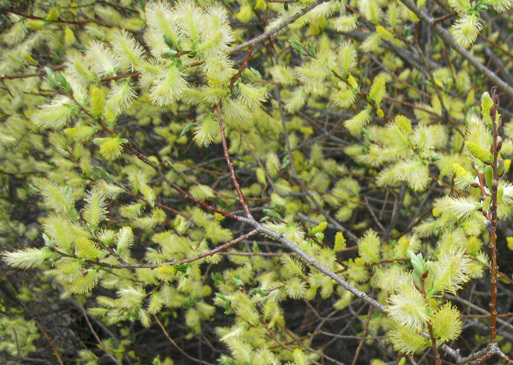 There were a few shrubs and flowers in bloom along the trail. I imagine there will be more later in the spring. Be sure to check out the trail map online or get a brochure at one of the trailheads if you ever use the Mickelson Trail. Besides showing the trailheads, distances, elevation profile, and routes through towns, it also notes historic facts and points out scenic views, spur trails, old mines, and other interesting things along the way. We've enjoyed our brief stay in the Black Hills and Rapid City but we have a schedule to keep. Next stop: a month in the Bighorn Mountains of northern Wyoming. Let's go!